Of course. Why not. Duh. Ladies and Gentlemen... 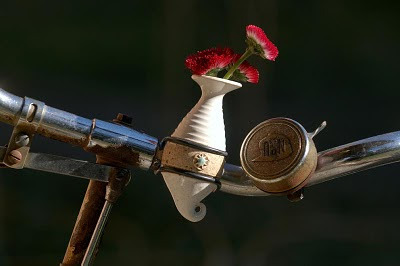 The Bicycle Vase. Cycle Chic in a ceramic nutshell. Really... what more is there to say? It's brilliant. 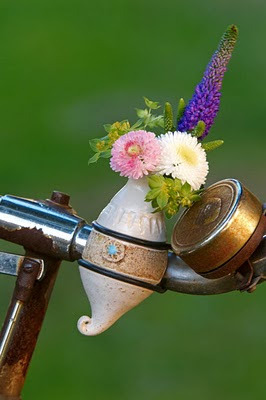 A lovely ceramic vase attached to your rusty handlebars with elastic thingys. So simple. So lovely. Cycle Chic approves. Approves so much we have tears in our eyes. From the website: "A view of the bicycle handlebars can offer more than cables and technical details. Why not shift down a gear and choose flowers over km/h?" Someone get me a tissue, please. This is fantastic. Perfect for our other baby - The Slow Bicycle Movement, too. The website for The Bicycle Vase is in German [and so very corny in a 1997 kind of way but it's kind of charming...] but we can reveal that the vase costs €14.90 plus postage, which depends on where you live, of course. The rest you can surely figure out with Google Translate. And here´s a better (and "official") version of the new Marit Larsen´s new video that I already talked about in another post. Fitting. Wasn't it Volkswagen that offered a flower vase in the New Beetle and was much ridiculed for that? Anyway, watering should never be a problem. I might just have to make one of those! I'll have to get rid of my silly odometer thingy to make room - this would be much better. This is hilarious! Lol & soo cute! If I owned a bike, I would definitely invest in a vase! Yep, that is adorable. Very thoughfully placed alongside the ringer too. Cute indeed. Wine, cheese and french bread in the panier? Ready for a lovely day! I just linked this to my blog. Hope thats ok. I am definately going to try and get one of these cases. It just makes sense!